Everybody loves St. Petersburg for its grandiose sights like the Hermitage or the Church of our Savior on Spilled Blood. Unfortunately, you can’t go back in time and immerse yourself in the 18th-century city, but now you can see it come alive in miniature form. It’s difficult to imagine modern St. Petersburg without such significant places as the rostral columns on Vasilevsky Island or the St. Petersburg University campus. Unfortunately today there’s no way to attend imperial masked balls in Peterhof or go on a traditional fall hunt in the nearby forests of the Leningrad Region like they did in the 18th century. However, now you can plunge into the most dynamic and spectacular period of the city’s history at Peter the Great’s Aquatorium, a miniature interactive model of old St. Petersburg on a 1:87 scale. 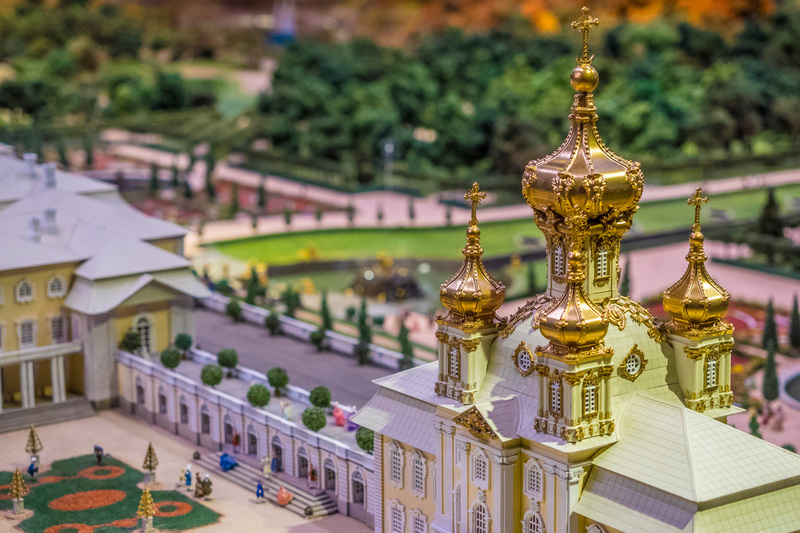 It is a 500 square meter model featuring a reconstruction of key sights of the city on the Neva including mansions, palaces, parks and places by the sea, including some that no longer exist in their original dimensions. Photo credit: Ruslan Shamukov While exploring Peter’s Aquatorium, you should wait until the lights dim and look at the palace illumination in Peterhof as if it was shining for the first time and appreciate the nuances of the changing of the fall colors at the royal palace at Oranienbaum. The city’s miniature model lives and moves just as the seasons and time of day change. Photo credit: Ruslan Shamukov What you have here is an authentic depiction of life in all its contrasts, reconstructed with historical accuracy and a jeweler’s meticulousness: The life of the aristocrats and that of the peasants, the crop yield, the fires and St. Petersburg’s infamous floods, which offers quite a realistic depiction. Most of the miniature model of St. Petersburg is inundated by a huge bowl full of water. Frigates move around in the winter water area of the Neva and the Gulf of Finland and when they meet they salute each other with cannon shots. Bring binoculars: It will help you to spot the sailors on the masts and the captains at the helm. Old sailing ships ply throughout the water without any human assistance and without electronic engines that are installed on radio-controlled ship models. Their movement is produced by a complex system of magnets and a computer program, whose technology was specially conceived and developed for Peter the Great’s Aquatorium. Even if you’ve managed to have a thorough visit of the entire model, each time you come back you’ll notice something new in its tiny figures, scenes of everyday life and in the tangle of its roads: A fox stealing chickens from a farmyard, a glimmering Christmas tree in the court of an old mansion, and even a fight at a masked ball: The cavaliers raise their fists while a servant uses her handkerchief to fan a lady that’s lost consciousness. Photo credit: Ruslan Shamukov The figures are put in motion both through regularly-scheduled intervals, and by pressing special buttons. Not only can you observe the action, you can also participate in the construction of ships in the Admiralty’s shipyards, the arrival of a horse-drawn carriage carrying an imperial personage or the dances at a ball. Why should you include Peter the Great’s Aquatorium in your bucket list along with Palace Square or St. Isaac’s Cathedral? You should include it because it represents an act of love for this city, but also a masterly show of attention to details and dedication to good humor. Most importantly it will allow you to plunge yourself in the city in a totally new way and enjoy sights that no longer exist.